Does That Name Mean Anything to You? Karen Pennesi is a professor at Western University, and she is also the Vice President of the Canadian Society for the Study of Names. She studies how individual’s names are shaped, perceived, and often judged by personal evaluation, familial values, and societal mores (her project is here, and on facebook here). I am fascinated by peoples’ names. One of my favourite things is how we react to another’s name. My family has a long-standing tradition for when we eat out at a restaurant. One of the four of us (my mum, dad, sister and me) looks at the bill, and at the top is usually the name of the person who served us our meal. The other three then try to guess the name; we are allowed to ask questions, and one of the first questions is almost always, “does the name suit him/her?” Amazingly, at least in our family, we all seem to have roughly the same understanding of what a suitable name is for a person we met, at most, 2 hours previous. Moreover, once we guess the name, we all immediately have a strong reaction as to whether that name “fits”. How do we form these notions about who is most suitable for which name? This is just one of the thousands of things I find so interesting about the field of onomastics. Professor Pennesi has so many interesting things to say, and many answers to questions I’ve had for years, so let’s get to the interview. Michael Iannozzi : First of all, what is onomastics? Karen Pennesi : Onomastics is the study of the history, structure, meaning and use of names. 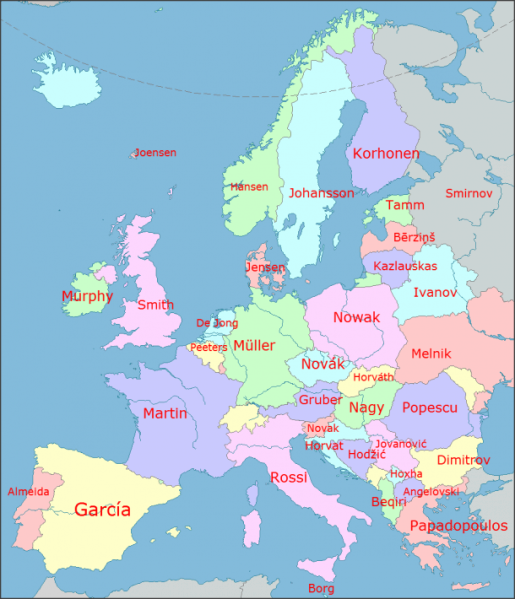 This is a broad field, which can include place names, personal names, brand names, and other types of names. My research is on personal names, sometimes called “anthroponyms”. MI : What led you to first begin studying personal names? KP : I think names are inherently interesting to anyone since everyone has a name, and some people have multiple names over their life span. I was looking for a research topic that would be broad enough to keep me interested and productive for the next several years, and which I could study locally (i.e. not have to travel to another country, as with my previous research in Brazil). Names are everywhere so that made it easy. Names are a great example of where language and identity converge. People often think about names as a kind of label to identify or refer to individuals, but names are also words. They have to fit into the sound system of a language and they have a structure, which is determined by social or cultural convention. For example, someone with an Indonesian or Mohawk name may only have a single name component, not a first and last name combination like we use in Canadian English. Meanwhile, someone with a Spanish or Portuguese name may have four or five name components if they have a two-part first name and the last names of both parents [for example, Salvador Dali was from Catalonia, and his full name was Salvador Domingo Felipe Jacinto Dalí i Domènech]. I also have had a long-standing interest in the ways people try to fit into new cultures. When I taught English in Korea, I noticed that many Koreans assumed English names in their English classes, and then continued to use them when they travelled overseas. When I taught international students in the U.S. and Canada, lots of them had English names, but many also continued to use their original names. I became interested in finding out why Koreans often take English names while Japanese or Iranians do not. Or why English-speaking foreigners in Korea do not usually take on Korean names while they are working there. For newcomers to Canada, this decision of whether to keep or change their name can be a big one. I had personal knowledge of several cases where people had difficulties with their names in Canada which led to various levels of stress, annoyance, inconvenience and even discrimination or exclusion. In my research I want to explore this relationship between identity and names: What kinds of names are problematic in a given context? Why? What kinds of problems result from a diversity of unfamiliar or unconventional names? How do different groups of people respond to these problems? What can be done to reduce some of these problems? MI : What have you found about the way people perceive their own names? And how does that personal perception affect their identity? KP : People seem to have different attitudes toward their names at different points in their lives. For example, a child might not like her name if she is teased about it, but then in adulthood there is no more teasing and she comes to appreciate it more. Or someone may have an indifferent attitude toward his name until he moves to a new country and suddenly his ordinary name is unpronounceable and strange and marks him as different. Then he might grow to resent the name, or feel that it is a burden or a hindrance. Others in the same situation might feel happy to be unique. Later in life when he builds more confidence and awareness of social inequalities, he might be proud of his name as a sign of his heritage. Some people feel that their name represents their essence so they could not conceive of changing it, whether that means keeping their last name after marriage or keeping their name after immigrating. Even if they don’t like their name or see that it is problematic, they simply can’t change their identity by changing their name. One of my graduate students is researching transgender name changes and she has found that choosing a new name to match the new gender presentation is a crucial part of the transition. Transgender people look for a name that “fits” their self-image and when they find it, there is a sense of relief and satisfaction in having their true self finally being addressed appropriately. In those cases, choosing a name is an overt act of identity construction. MI : What can you tell me about how people perceive the names of others? KP : There has been research showing that names perceived as “foreign” reduce the name-bearer’s chances of being hired for a job. That happens in Canada, the U.S., Europe, etc. so what is considered “foreign” will vary, but the effect is the same. A similar form of discrimination occurs with access to rental housing where certain kinds of names are interpreted as representing an undesirable race, religion, nationality or culture and the applicants are denied. MI : And do these perceptions, or even prejudices extend to names thought of as “non-foreign”? KP : There are findings showing that particular names come to be associated with certain characteristics or social categories. For example, people may assume that a guy named Josh is “probably good at sports and fun to hang around”, whereas a guy named Bryce is “probably a spoiled snob”. A woman named Dolores is “probably an old lady or an immigrant”, while a woman named Jennifer could be almost any age or social class. People expect Lebron to be Black and Brittny to be white. These are all just examples and of course those associations are based on a combination of stereotypes, personal experiences and social trends. The point is that people do make assumptions and judgements about other people based on subjective perceptions of names. MI : Your research has focussed on the names of Canadian immigrants. How are the names of immigrants perceived by Canadians? 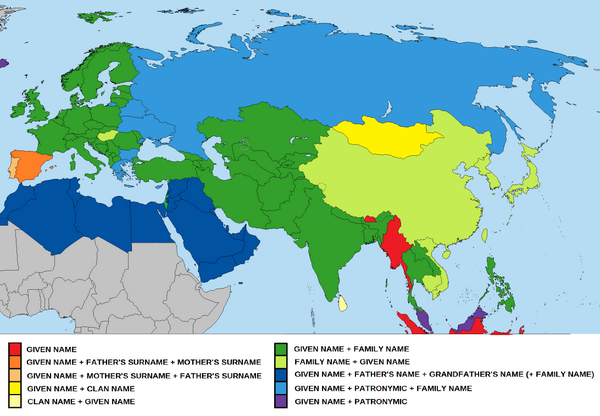 Is the “foreign-ness” of a name based on a pattern or particular sounds? KP : Familiarity is key. Italian names may have been considered foreign or difficult to pronounce for Canadians 70 years ago, but now they are more familiar and people will not hesitate in trying to say them. That’s a question that really depends on who you are asking. My research has shown that what counts as a “difficult” or “easy” name depends on personal experience (do you know many people with that type of name? ), general linguistic ability (are you good at learning languages and pronouncing unfamiliar sounds? ), and general attitude toward different kinds of people (if you have a negative attitude toward diversity you will likely dismiss “foreign” names as too difficult to even try). MI : What is it that leads to certain names having certain associations for people? KP : This has to do with race, ethnicity, class and age. Parents choose names which fit their social groups. There was a study done that showed how upper-class girls’ names come to lose their high class status as more middle class girls are given that name by upwardly aspiring parents. The same thing happens with the lower-class parents, and eventually names like Ashley and Brittany, which used to be only found among white upper-class girls are now among the most popular names for lower-class girls (in the USA). Meanwhile, there will be a new list of upper-class girl names to replace the ones that have been taken over by the lower classes, in order to maintain the distinction. The particular associations also depend on how you come to know the name, the actual individuals you meet with the name and how you perceived them. I have a friend who thought Angus was a Chinese name because the only boy she ever knew with that name was Chinese. MI : Whenever I’m asked what my surname is to, for example, make a reservation at a restaurant I instinctively just spell it out. Is this common, and what does this reflect about society’s acceptance of uncommon proper names? KP : I have heard of this strategy before, especially when on the phone or talking to service personnel who do not know you, and will not interact with you again. I think this comes from a desire to avoid mistakes, but also reduces the potential for embarrassment for you or the service agent. It’s a recognition that there is great diversity in names which can be difficult and that there is no expectation that any individual should know how to spell or say every name. It does reveal your own assumption that the person on the other end will have difficulty if you don’t spell it out. Some people might find that unnecessary if they consider your name “easy”. MI : Speaking of fitting into certain social groups, how do celebrities shape perceptions of people with the same first name, and the name’s general popularity? KP : There are statistical studies which show that popular movie or TV characters, or even politicians, prompt an increase in the number of babies with those names in the years following the famous person’s height of popularity. This can also work the other way for names that become associated with people who are famous for negative reasons (e.g. decrease in the number of boys named Adolf or Osama). MI : How have naming conventions changed in our society, and what do those changes reflect about us? KP : Naming conventions reflect social changes and the way the society is organized. In Canada, all babies must be given at least two names: first and last. This partly has to do with the government’s need to identify individuals for things like taxes, education, voting etc. It used to be the convention that the father’s last name was the baby’s last name unless a father was not identified. Now, with divorce and remarriage resulting in blended families, hyphenated or double last names are becoming more common. Double last names are also common in situations where married women keep their last name throughout their lives instead of changing it to match their husband’s. So the current naming practices for children reflect these social changes about the position of women in society, and how that has affected marriage and the constitution of families. It also means it is harder to make assumptions about people based on their names: a child may have a different last name from his mother, and you won’t know if that is due to his mother never having married but naming the child after the father, the mother having remarried and changed her name again, the mother never having changed her name, the child being adopted, or the child being a step-child of the mother. A teacher who knows only the child’s surname cannot assume that the mother should be correctly addressed as Mrs. or Ms. Child’s-last-name. This would not have been a problem 50 years ago in Canada when it was pretty safe to assume that children and parents all shared a common last name. MI : Each year a list of the most common baby names for both boys and girls is released, what does this list show you about parents and about our society? MI : Do you find yourself reading more or less into someone’s name since you’ve begun your research? KP : Yes, I am more acutely aware of comments people make about other people’s names, whether positive or negative. I make a point of not commenting on people’s names unless I am talking about the research. Most people I’ve talked to don’t want their name to be evaluated or commented on (“that’s different”, “how do you spell that?”, “that’s a pretty name”). They just want to tell you their name and get on with the conversation. If you make a joke or a comment, chances are they’ve heard it all before and that can be tiresome. I do my best to pronounce and spell people’s names the way they prefer, but I don’t make a big deal about it, and I won’t call too much attention to it. MI : What would you like to do next with your research on onomastics? KP : I am still interested in the social usage of names, and the constraints on naming particular groups face, such as immigrants and First Nations people whose naming practices and writing systems do not conform to institutional requirements. I want to explore those issues from both sides to see how institutions deal with the challenges of name diversity in Canada as well as how individuals “live their names” in different ways, and with different consequences. A sincere thank you to Professor Karen Pennesi. I think names are often taken for granted. We often see them as simply designating a person, the way the word ‘basil’ designates the delicious herb I happen to be very fond of. As Professor Pennesi points out, a person’s name can shape their experiences in life, both in how they see themselves and how others engage with them.